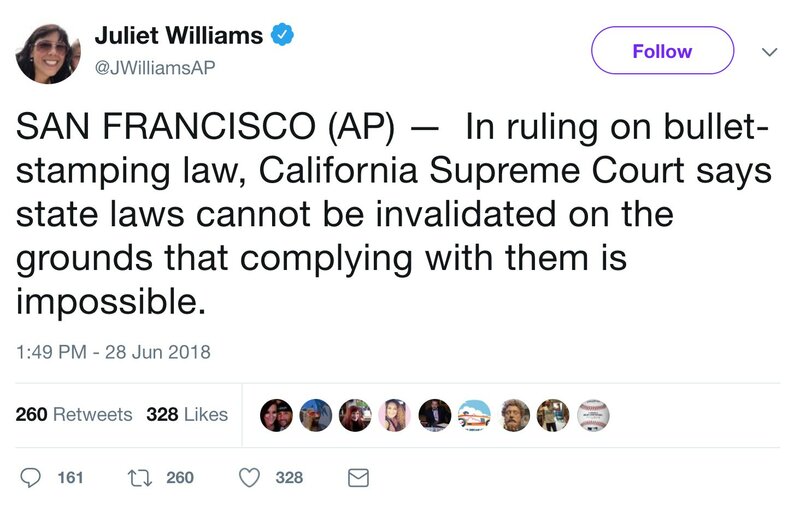 California's Supreme Court unanimously ruled Thursday that the state's legislature can pass a law knowing full well that compliance is impossible. The law in question, as described in the Associated Press's coverage, requires "new models of semi-automatic handguns to stamp identifying information on bullet casings when shots are fired." The underlying law defines any such weapon without this technology as an "unsafe handgun." The AP's Sudhin Thanawala described the law as "unusual." The wire service's headline called it "rare." Though the tweet wasn't a joke, the ruling is a sick joke on the rule of law, a tragic victory for gun-control zealots, and yet another reason why citizens' respect for the law and politicians is eroding . Plaintiffs didn't "argue" that the technology doesn't exist. They factually asserted that it doesn't exist, and the court agreed. Thanawala's and AP's treatment is particularly galling, given that the wire service has recently given in to leftist pressure to characterize certain statements made by President Donald Trump in supposedly objective dispatches as presumptively false, even though their veracity is either a matter of opinion or open to dispute. On Sunday, during an interview with Fox News's Chris Wallace, former Homeland Security chief Jeh Johnson acknowledged ("I freely admit") that the Obama administration had "a" policy to separate illegally immigrating families. So all AP had to defend its underlined contention that Trump has "falsely blamed" Democrats is the meaning of "the." Given Trump's actual mid-June statements on the subject, the AP's contention about them — notably not quoted — is highly debatable and no place in a supposedly objective report. The court ruled that currently "complying with the statute is impossible." 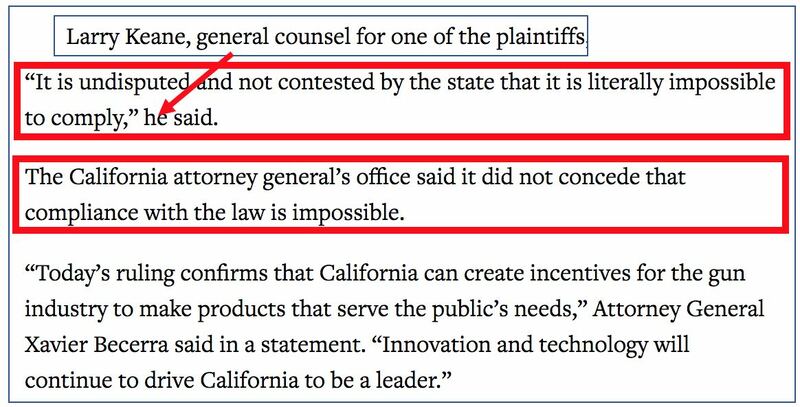 As an officer of the court, Xavier Becerra is required to concede that already objectively factual point. Therefore, he lied. But the AP wouldn't characterize his false statement as false. There should be little debate about the result of the ruling, assuming it survives appeals. Tom Blumer was a contributing editor for NewsBusters.